The 43rd Edition of FILMETS BADALONA FILM FESTIVAL, that will be held from 20-29 October 2017, will screen in official section about 250 short films from the five continents. Most of the shorts films, about 120, are fiction, while about a hundred are animation. For the first time in the history of the FILMETS festival, the three municipal theatres of Badalona will offer screenings of short films. They are, the Zorrilla Theatre, which will be the main venue, along with Blas Infante Theatre and Principal Theatre. Also, the Institut Français of Barcelona will be the official sub-site of the festival. The Centre Cultural el Carme will be the venue of Filmets “Pro”. In this year’s edition, Germany will be the country in the FOCUS FILMETS section. In addition to the screening of short films from this country, the event will be attended by different directors that will present their works. The Nit de les Venus will be held on Saturday 28th October at 10 pm at the Zorrilla Theatre. Sunday 29th October at 5 pm, all the films that won the Venus of Badalona Prize will be screened at the same Zorrilla Theatre. The International Official Jury of the 43rd edition of FILMETS BADALONA FILM FESTIVAL will be composed by Saskia Walker (Germany); Marta Swiatek (Poland); Lluís Danés (Catalonia); Aurélie Chesné (France) and Mayra Tinajero (Mexico). All members of the jury play very important roles in the cinematographic world. In this way, Saskia Walker is part of the Berlinale’s selection committee of short films; Marta Swiatek is coordinator of fiction and animation short films in Poland; Lluís Danés is director and set designer; Aurélie Chesné is a consultant in short film programming at France Télevisions. Finally, Mayra Tinajero is marketing director at Reelport film platform. 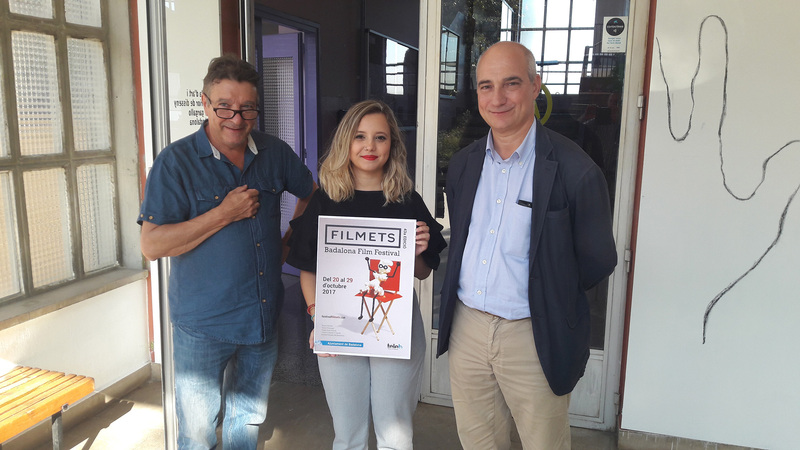 The poster, which will be the image of the 43rd Edition of the FILMETS Badalona Film Festival, has been already been published. Its author is Mariona Jiménez, a second grade student of the High-level technical Degree in Printed Graphics of the Arts and Design School Pau Gargallo of Badalona. The poster shows a popcorn kernel –an absolutely necessary element when spending an afternoon in the cinema– sitting on a chair’s director watching a short film in an amused attitude. The Arts and Design High School Pau Garagallo, like in the past ten years, organized a contest to choose the festival’s poster. This year thirty students from all levels participated. A jury chose the finalists and the winner was Mariona Jiménez. 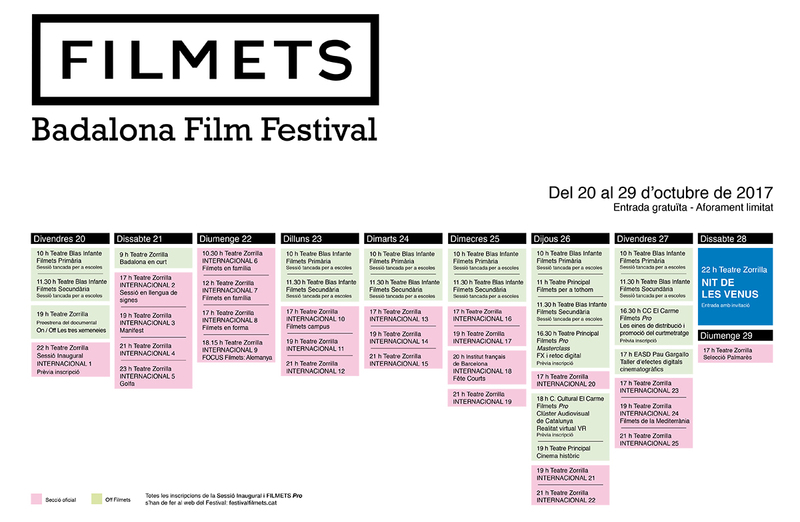 The opening session of FILMETS Badalona Film Festival, which will take place on October the 20th at 22 h in Teatre Zorrilla, is open to all citizens. Previous registration through the web is needed. To get a personal invitation, please click on: https://www.festivalfilmets.cat/en/inscripcio-inauguracio. The rest of the festival’s section, except for The Night of the Venuses and the morning sessions corresponding to the OFF FILMETS section, aimed to the schools of Badalona, are open until full capacity of the theatres where the festival takes place. All of the short films shown in FILMETS Badalona Film Festival are free of charge. FILMETS Pro will start a masterclass about FX directed by Jaume E. Vilaseca with the title “Els efectes digitals cinematogràfics”. It will take place on 26thOctober at 4:30 pm in Teatre Principal, at Carrer Francesc Layret, 41. Free entrance. After this theoretical part, next day, the practical part will be carried out with a workshop about cinematographic digital effects, directed by Jaume E. Vilaseca too. It will start on 27thOctober from 5:00 pm at Escola Superior d’Art i Disseny Pau Gargallo, at Carrer Molí de la Torre, 16. On 26th October at 6:00 pm will be held at El Carme Cultural Centre and organized jointly with the Audiovisual Cluster of Catalonia, the meeting with professionals to discuss the possibilities of Virtual Reality for the short film industry. Free entrance, but capacity is limited. Agustí Argelich, director of FILMETS Badalona Film Festival, will be the moderator of the meeting where all these professionals will participate. To attend FILMETS Pro you must register starting today, 14th September, via festivalfilmets.cat website and apply for it. After registration, you will receive an email confirmation with your request. Capacity is limited.